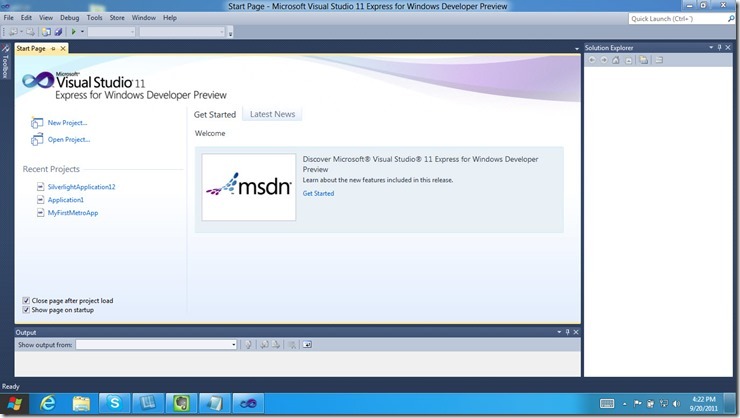 The Microsoft developer ecosystem has been alive with buzz about Windows 8 all week at the Build conference. 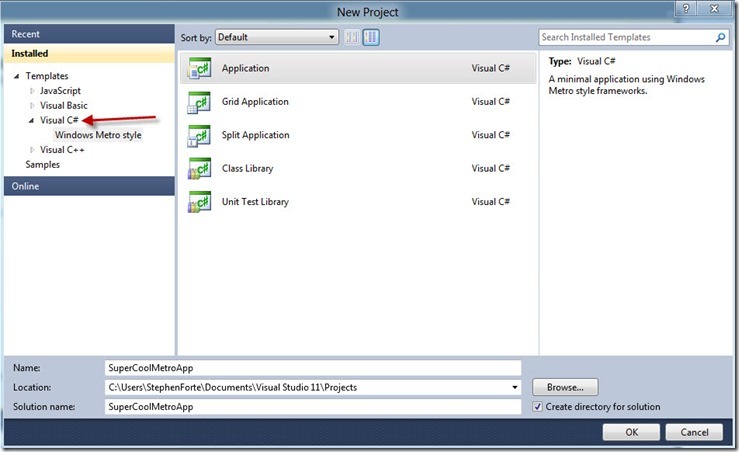 What everyone is talking about is the new Metro user experience and interface and the new WinRT API that supports it. 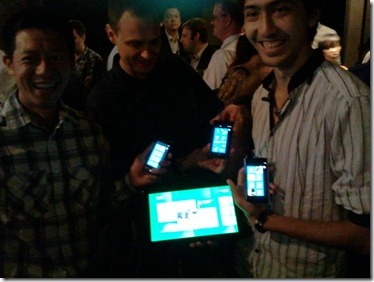 I was one of the lucky ones who got a ticket to Build before it sold out and received the developer prototype hardware tablet running the early preview of Windows 8 (I’ve never had prototype hardware before!) After playing with it for a few days, I can say that while the app store is not open yet and it is obvious that the software is pre-alpha (there is no Metro mail client for example) running on prototype hardware, I can tell you that the new Metro UI experience is awesome. The iPad will have true competition. As I have played with Windows 8 all week, I never found myself going to “Desktop” mode on the tablet. As I interacted with the Metro tiles, I found myself doing all of the “tablet” things I normally do on my iPad. When I had to “work” (like write long emails and blog posts), I found myself using my laptop. Windows 8 gives you the ability to have the “best of both worlds” where you can use the Metro style UI and then when you need to, dock your tablet into a station and use it in “desktop” mode using traditional Windows with a mouse and keyboard. This is a great feature that will undoubtedly be used by millions of people. 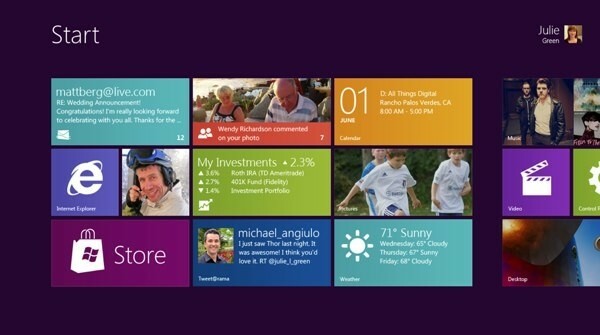 That said, Microsoft needs to OEM a version of Windows 8 to tablet hardware developers that will only run in Metro mode. 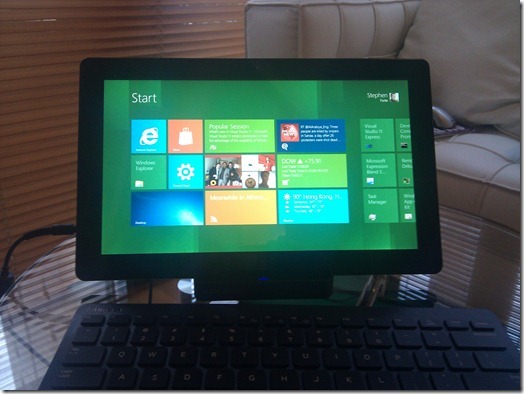 While I fully expect that my next laptop will have a touch screen and I will interact with Windows 8 Metro mode often on it, my experience on the laptop will mostly be running in traditional desktop mode with a mouse and keyboard (try writing this blog post on a tablet today). 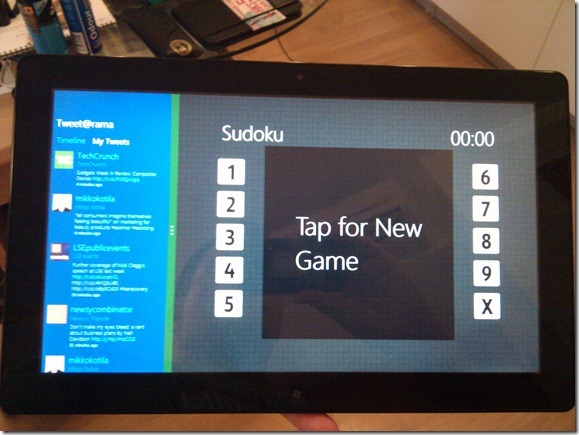 At the same time, I would also want a (cheaper) Windows 8 tablet where I only interact with the Metro UI. Just like how I have a laptop PC and tablet iPad today, I use each in different scenarios. In short, laptop for work, tablet for play. When people buy a tablet like the iPad, they want the immersive experience and that experience only. I have argued before that people don’t want a tablet that is a laptop replacement, they want both devices. When using a tablet, I don’t need to go out to the desktop mode and use Outlook, I just want to use the touch UI and a lightweight app for my mail. When using my laptop, I don’t want the constraints of a tablet. They are different devices that have different uses. With a Metro-only SKU of Windows, the tablet vendors can build truly awesome experiences that don’t have any of traditional Windows running. They can build lower power devices that run on ARM and hit the $500 or below price point. It will be clear that this is a “tablet” and not a PC. People love the experience of the iPad, they like how they are constrained and can’t do the things they do on their PCs. These constraints force the consumer to interact with the iPad differently, and that has led to its success. If Windows removes those constraints, allowing the tablet users to shell out to Windows, then it will most likely confuse the customer and ultimately fail. Just like all of the Android tablets trying to add “laptop” features and have failed so far. I asked a Microsoft executive point blank yesterday if they were going to have a tablet Metro-only SKU of Windows. While he said my question was “insightful”, he said Microsoft has made no SKU decisions at this time. At least he did not say no. I have argued before that the Android tablet market is a mess and can’t compete with the iPad. I said that the Android manufacturers were developing a tabletized laptop while Apple was developing an “experience” centered around their integrated services. I made the claim that only Amazon can really take on the iPad with its integrated experience and books, music, video service as well as its own AppStore. Last week it was leaked that Amazon is nearly done with a 7 inch Kindle branded Android tablet. It should sell for about $249 and hit the markets in October or November. While it is true that Amazon will be taking on the iPad and giving the iPad its first real competition, the real game-changer is for the Android tablet market. Analysts are already saying Amazon will sell 5 million units-this year. (That means in 2 months!) Except for maybe the Galaxy Tab (before Apple sued Samsung due to patents), not a single Android tablet was able to penetrate the market. If they could not stand a chance against the iPad, they will stand absolutely no chance against both the iPad and Kindle-pad. Another loser in all of this is Google. Since Android is Open Source, Amazon took a pre 2.2 version of Android, forked it and customized it for its own needs-without any interaction from Google. No Google apps, no Goolge Marketplace, all Amazon branding and Amazon services. So the best selling Android tablet will have nothing to do with Google! Back in January, I argued that AppStores are not necessary as mobile economics mature and start to mimic web economics. Why do I need to download Skype from the AppStore when I can just go to Skype.com and do the same? "Our philosophy is simple -- when Apple brings a new subscriber to the app, Apple earns a 30% share... When the publisher brings an existing or new subscriber to the app, the publisher keeps 100% and Apple earns nothing." Talk about a finders fee! Take the Kindle for example. If a new customer downloads the Kindle on the iPad and buys a book for $10, Apples gets $3 from Amazon, killing its margins. The same for the New York Times, Economist, Financial Times, and other magazines. What particularly vexed those publications is that Apple would tell the publisher absolutely nothing about the subscriber (Apple owns that data! ), reducing any ability to personalize marketing to their own subscribers! The content producers started to fight back. Amazon was the first to strike with its web based Kindle Cloud Reader. It is a web application that uses web standards (HTML5) to allow users to read (online or offline!) their books. You can install a link on your iPad home screen making it look like an app, but it is not. It is just a web site and you completely bypass the AppStore, allowing Amazon to keep 100% of the revenue and customer data. Another popular content producer struck an even deeper blow to the AppStore. The Financial Times, the winner of the Apple Design Award in 2010, has done the same as Amazon and released a cloud based version of their popular iPad app. Then in a move that can only be described as insurrection, the Financial Times has pulled its (award winning!) iPad and iPhone apps altogether from the AppStore! With such moves by industry leaders Amazon and the Financial Times, the floodgates are open for others to follow. 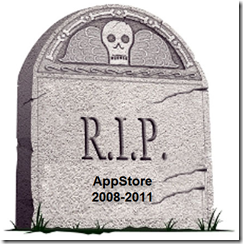 Apple can’t block the web in its devices, so it is the end of the AppStore as we know it. Even if Apple comes back and says, “ok ok, we will only take 3%, not 30%”, why would Amazon give Apple 3% when it can keep 100% for itself? Tasting freedom, publishers will never come back. It was nice knowing you AppStore. RIP. If you and I were at a local Starbucks drinking coffee and plotted a criminal act (say robbing a bank), would Starbucks be liable? Is Starbucks a co-conspirator since they provided a platform for us to plan our illegal act? In short, no. If you and I email back and fourth about that same criminal activity, is GMail/your ISP liable? In short, no. If we do rob the bank and FexEx someone the contraband, is FedEx liable? In short, no. If I illegally download MP3 music and upload it to Amazon Cloud Storage, Microsoft Skydrive, Dropbox, or some other similar service, are they liable? A judge last week said no. This allows the Internet Economy to work. Google is not liable for someone searching for illegal things, Microsoft is not liable for someone using Excel to plan something illegal, Dropbox is not liable for what it stores, and Telerik is not liable for someone using our software for something illegal. Score one for the lawyers today.